L-R: Deputy Chairman-in-Council, Institute for Government Research and Leadership Technology, Professor John Akanya OON, presenting the Most Innovative Smart Mobile Phone of the Year Award to Nokia representatives; Innovation Manager, Nokia Research Center, Nokia West Africa, Moses Acquah; Channel Marketing Manager, Nokia IMEA, Tushita Garga and Marketing Manager, Nokia Ghana, David Anku during the African Product Award 2013 held at Sheraton Hotel, Ikeja on Friday, December 13, 2013. 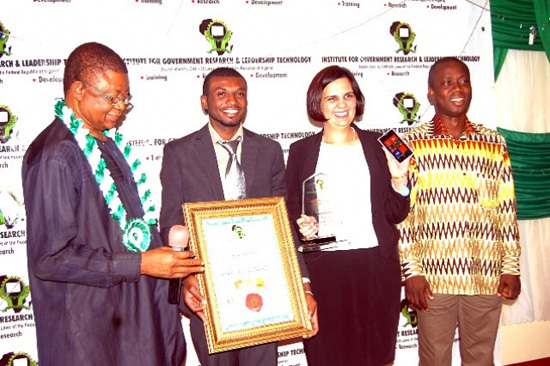 Leading phone manufacturer, Nokia, has been awarded the Most Innovative Smart Mobile Phone of the Year at the 2013 African Product Forum organized by the Institute for Government Research and Leadership Technology (IGRLT) at Sheraton Hotel, Lagos. Country Director, Institute for Government Research and Leadership Technology, Ambassador Moses Essien explains that in a research conducted amongst various mobile phones using the parameters of “product high quality, value creation, track record and efficacy; product availability, affordability, acceptability and reliability; conformity with global quality for a good smart mobile phone brand; compliance with government regulatory laws and guidelines” amongst others, Nokia outperformed its competitors. The African Product Forum is an annual event organized to contribute to the expansion and increment of knowledge with the aim of encouraging businesses through sponsorship of trainings, seminars and public enlightenments in respect of product development. The 2013 edition of the forum held with notable guests and experts from various fields present to impact knowledge to business owners and potential entrepreneurs while also featuring product exhibitions, music and dance. Earlier in 2013, Nokia received two awards namely the Coolest Phone Brand Award at the maiden edition of The Businessday Generation Next Survey Awards and Mobile Phone Brand of the Year Award at the 2013 Marketing World Awards.